Enriched and well rested dogs! I thought about their lives, what they do all day and was happy with what I can provide. They get a walk on most days – sometimes longer, sometimes shorter. Sometimes off-leash, sometimes on-leash. I read once how dogs should get out every day – even if it’s just to go out and get the mail or bring out the trash. They need to smell the fresh air and investigate the world around them. My dogs have enrichment. They get physical exercise and lots of chewies (bully sticks, marrow bones, rawhides, etc). They have companionship both with each other and many humans. They have boundaries but also lots of freedom. I let them shred paper or give them the paper towel cardboard roll to chew up. I let them carry my shoes around even if I can’t find them when I need to put them on! They sleep on the bed at night if they wish. They hang out with us when in the yard or doing projects. They lie down in the dining room when we have meals and mostly behave :). I also train them. Training sessions make up very little of their day, but th ey are always learning and we are always training to some degree. Training, whether formally or informally, is what enables us to make sense of each others world. It teaches us how to communicate with each other and how to get along in our daily lives – what our expectations are and continuing to build that bond and relationship. I make sure they have a pretty good cue vocabulary which improves our communication. I tire them out physically with agility or obedience games where they use and tire their muscles. I teach new concepts and cues to tire them out mentally. 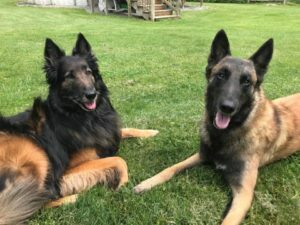 I teach them to track my scent in a field and put our scent puzzles for nosework – both mentally and physically tiring and intrinsically reinforcing! If you are looking for something new to try with your dog – to tire them out – check out my classes at Savvy Dog Sports and the August schedule at Fenzi Dog Sports Academy. I’m teaching 3 different topics online this term …. Obedience Start Games – no heeling required! Intro to Handler Discrimination Scent Work – a low impact course that is perfect for training at home and tiring your dog out! And continuing the Core NW series with Intro to Nosework Search Elements. Lots of other great classes offered also! Registration opens July 22nd and classes start August 1st! Perhaps I need to get more exercise myself and learn some new skills so I can sleep better at night too! Wonderfully written and a great reminder to live a balanced life! What is your dog’s search recovery time? Subscribe to get blog notifications!